Kimchi chigae is a very popular soup made primarily with kimchi. It is often prepared using older, more fermented and ripe kimchi, creating a stronger and flavorful taste while fresh kimchi may not bring out the full and rich flavors. Different variations can exist but sliced kimchi is usually put into a pot with tofu, onions, garlic and beef, pork or seafood, which are all boiled together with water or anchovy stock. 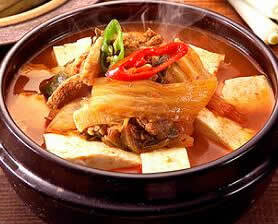 The soup is seasoned with either dwenjang and/or gochujang which contributes to the distinctive red color. Final soup is normally served in a stone pot and still boiling when served on the table. Typically, kimchi chigae is eaten with a bowl of rice accompanied by various side dishes. Place a pot on the stove, turn the heat on. Add pork belly (or bacon), sauté for a minute or so. Add gochujang and cook until meat becomes white. Pour the water, add kimchi. Bring to a boil, reduce to simmer. Add soy sauce, gochugaru, and garlic. Cook for 20-30 minutes. Add chilies, green onions, salt and pepper. Cook for another minute.